Best grown in moist, fertile, organically rich soils in full sun to part shade. Foliage decline can occur rapidly if soils are permitted to dry out. With consistent moisture, it performs well in full sun in the northern portions of its growing range. It prefers part shade in the southern part of its growing range. Removing faded flower stalks will not prolong bloom, but may improve plant appearance, particularly if a ground cover look is desired. On the other hand, flower stalks on female plants may be left in place to enjoy the continuing ornamental effect of the dried seed plumes. Plants can be slow to establish. Plants may struggle in the hot and humid conditions of the deep South and are not recommended for gardens south of USDA Zone 7. Aruncus dioicus, commonly called goat's beard, is a Missouri native plant which occurs in moist woodlands and along bluffs in the central and southeast part of the State. A tall, erect, bushy, clump-forming plant typically growing 4-6' high which features pinnately compound, dark green foliage and showy, plume-like spikes of tiny, cream colored flowers which rise well above the foliage in early to mid summer, creating a bold effect. 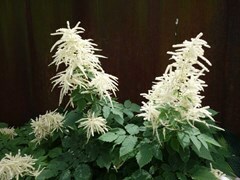 This rose family member is somewhat similar in appearance to astilbe. Dioecious (separate male and female plants) as the species name suggests. Plants with male flowers (numerous stamens per flower) produce a showier bloom than plants with female flowers (three pistils per flower). Specific epithet means having separate male and female plants. No serious disease or insect problems. Some susceptibility to leaf spot. Tall growing plants are excellent background plant for shady, moist spots in the border or in a woodland, wild or native plant garden. Plant as a specimen or in groups along streams or water gardens.